A cancer diagnosis is undoubtably terrifying. In that moment, a person’s life is altered, and staying alive takes on an immediacy that most of us are lucky to never experience. But when you’re a parent dealing with a cancer diagnosis, the effects of your illness on your kids add a whole other layer of worry, fear, and difficulty. 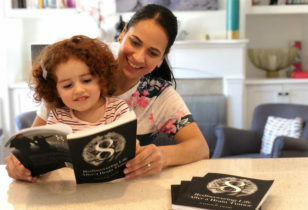 Sara Olsher was a single mother raising her seven-year-old daughter on her own when she was diagnosed with cancer. She shares how she navigated her new reality with her young daughter, and some of the brilliant tools she employed to explain a host of very grown-up realities to her child. My life has a Before and an After. Before, I thought I knew hardship and pain. I thought I’d “seen things.” I thought I knew what was important in life. But, then, After. After my world cracked open and I fell into an emotional chasm, I became a totally different person. I look at photos of myself from two years ago and don’t even recognize myself. To be honest, I don’t recognize myself in the mirror, either. Cancer—real cancer—is something that happens to other people. But as I sat there, a little bit of reality started to creep in. 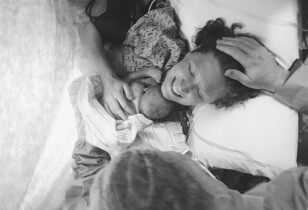 Earlier in the year, I’d lost a 32-year-old co-worker and friend to breast cancer—a horrible, sick reminder that none of us, even the healthy and young, are safe from terrible things. “This isn’t part of my plan,” I said to the radiologist, who looked at me sadly. “It’s not part of anyone’s plan,” he said. “No,” I said, “It’s really not part of my plan.” I started to cry. I’d been a single parent for six years, and I’d finally found love six months earlier. My daughter and I were finally, really happy. The focus of the next few months was to blend our families, not deal with cancer. A future where I die and leave my beautiful seven-year-old daughter with her father was not one I could emotionally entertain. But unfortunately, cancer doesn’t give us a choice. We don’t get to say that someone else is more deserving of this diagnosis. There is no return-to-sender. You get what you get, and you don’t get upset. Well, actually you do get upset. Very upset. And then you deal with it. But when you have kids, especially small kids, “dealing with it” poses a whole host of challenges that older cancer patients don’t have to face. It’s hard enough to surrender to the “journey” of cancer when you don’t have little humans who depend on you. Add kids to the mix, and you’ve got at least 10,000 more things to wake up at 3 a.m. and worry about. The summer before my diagnosis, my daughter worried pretty much incessantly that something terrible would happen to me. For her, those worries took the form of monsters and ghosts. At the time, I confidently told my child that monsters don’t exist, so nothing bad would happen to me. I shielded her from the real things that can steal mothers from their children, like car accidents and cancer, and I tried not to think about those things myself. But the moment I was diagnosed, my first horrible thought was a vision of her tearful face at my funeral. What happens when worries are founded in reality? Monster spray from Pinterest doesn’t work when the threat is real. And when we find ourselves staring death in the face, it’s easy to go off the deep end. As I made my way through treatment, I started to realize that parenting kids through cancer isn’t something that a lot of people are talking about. Previous generations didn’t even tell their kids what was going on, let alone include them in the process. My own cousins lost their mother to cancer, her prognosis veiled in secrecy. The consensus seems to be that we’ve got enough on our plates fighting cancer, and the kids will be alright. So, while my doctors and nurses rallied around me to save my life, they offered literally no guidance for how to help my daughter. The truth is, having a small child adds a lot of stress—something cancer patients are constantly told to avoid—as we worry about whether the kids will actually be alright. They’re acting out, they aren’t sleeping well, and they have big existential questions that they might not want to talk to us about. We worry about them, and that worry adds a huge, honkin’ thing to our plate. What we end up doing is navigating each emotional land mine, one at a time. We do the best we can, crawling on our hands and knees in the dark, unsure of what lies ahead, afraid that one misstep could cost us our lives, or scar our children forever. I had a flashlight in the dark, though, which is more than I can say for most parents who have cancer. For years I’d run a business based on talking to kids about divorce, and knew a lot about how to talk about feelings. These skills were a lifeline during a time that was harder than my divorce by about 10,000 miles. Research shows that talking to kids about what’s going on is far better than trying to protect them with silence, though it’s certainly more difficult. The truth is, they understand a lot more than we give them credit for—even very small kids—and not being open with them leaves room for them to make up stories to explain your strange behavior. And because kids developmentally believe the world revolves around them, a lot of the time they end up blaming themselves. I ended up telling my daughter that I had cancer once I knew a little more about my treatment plan. As an illustrator, I was able to draw things out for her and explain the science to her in a funny way, so I didn’t scare her (and I actually turned it into a children’s book to explain cancer to kids, which I decided to give away for free in order to help other families in our position). Still, I was terrified to have the conversation. When it was over and she seemed okay, I thought the worst was behind me. But going through cancer treatment is a heavy physical and emotional burden. It is impossible to prepare yourself for it, even if you do all the research in the world. Everything—and I mean everything—changes. In our house, my mom and my boyfriend essentially moved in right away. 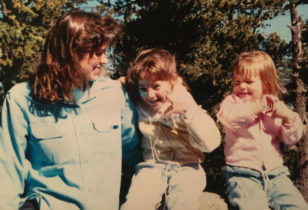 I was physically unable to play like I had before, and was so emotionally exhausted that I couldn’t even come up with ideas for entertaining or connecting with my daughter much of the time. Different people were doing school drop-offs and pick-ups, taking me to appointments, and cooking dinner. Our custody schedule changed to accommodate my chemo infusions. Keeping track of it all involved a complicated, color-coded shared Google calendar—and of course, my daughter couldn’t see the Google calendar and had no idea what to expect each day. I ended up creating a visual calendar to help kids understand a parent’s cancer treatment, which was a huge help to my daughter. 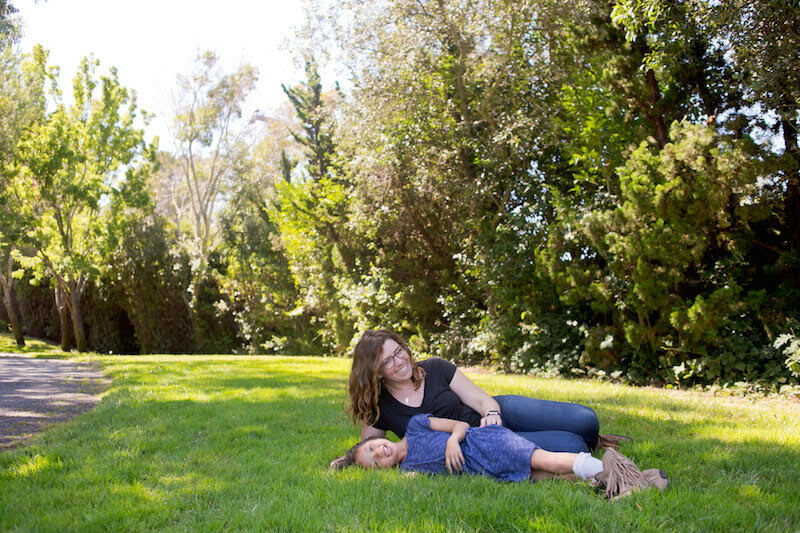 It helped her see who would be picking her up from school, so she knew she wouldn’t be forgotten, and it also helped us plan out some quiet activities to look forward to, which helped us stay connected through multiple surgeries, chemo, and radiation. Life after cancer treatment is not a return to normal. My world was shattered, and I’ve spent months picking up the pieces, trying to glue them back together. I will never be the same. My body looks different, and the medication I take to keep my cancer from returning makes me feel arthritic and tired. I have insomnia, and my brain is still recovering from the after-effects of chemo. With each passing day, though, things improve. I feel a bit more like myself, and my near-constant anxiety about death is now occupying about 80 percent of my brain space, instead of consuming it in its entirety. As for my daughter, I think she is alright. What I know for sure is that she has her mother back. And for that I am eternally grateful. Thank you Virginia! A big hug to you and your whole family. The cancer experience definitely never leaves you.